Port Elizabeth - Dale Steyn took five wickets as New Zealand were forced to follow on 404 runs behind on the third day of the second and final Test against South Africa at St George's Park on Sunday. The Black Caps were three for no wicket at lunch, still trailing by 401 runs. 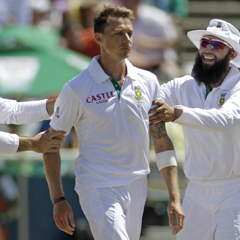 Steyn had a spell of three wickets for three runs in five overs on Sunday morning to reduce New Zealand to 62 for nine in reply to South Africa's 525 for eight declared. He finished with five for 17. But BJ Watling made a defiant 63 and added 59 for the last wicket with Trent Boult (17 not out) to enable New Zealand to reach 121 before Watling was last man out, caught at first slip off Morne Morkel. It was a record tenth wicket stand for New Zealand against South Africa. Watling, the New Zealand wicketkeeper, followed up a marathon 42 during New Zealand's innings defeat in the first Test in Cape Town with another composed, impressive performance. He faced 87 balls and hit 13 boundaries. New Zealand opening batsman Martin Guptill was given out caught behind by umpire Ian Gould after being struck by a vicious Steyn bouncer in the first over of the second innings but Guptill successfully sought a review which showed the ball had deflected off his shoulder, not his glove.